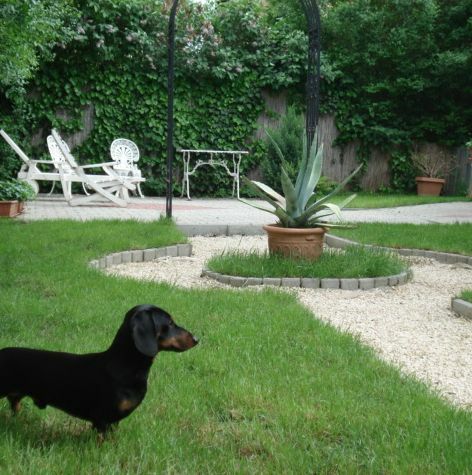 Our primary aim is to breed dachshunds of good reputation, who are healthy, with excellent bloodlines, free of any genetic illnesses, with stable nervous systems and who, besides being of quality show dogs, will also bring happiness to their family and those around them. We provide the owners of the dogs bred at our kennel with all the theoretical and practical assistance needed to raise and train their dog, and help them prepare for a successful participation in dog shows. The dogs in our kennel are treated as family members who share our everyday life. We limit their number to ensure that we are able to spend sufficient time with each and every single one so that none of them feel excluded or wanting. Years ago, I consciously sought a breed that can be raised and kept in a flat, but is more than a simple lapdog in that it is temperamental, passionate and intelligent. While the dachshund is originally a hunting dog, it is suitable for anyone irrespectively of whether or not they hunt. The dachshund's personality cannot be confused with that of any other breed. 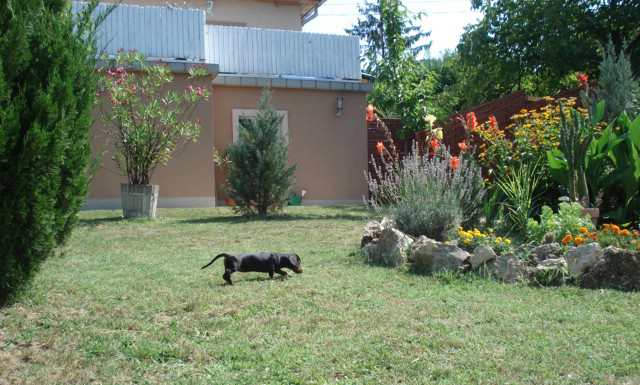 The dachshund, even if well trained, will always retain a certain degree of independence and a strong willfulness. 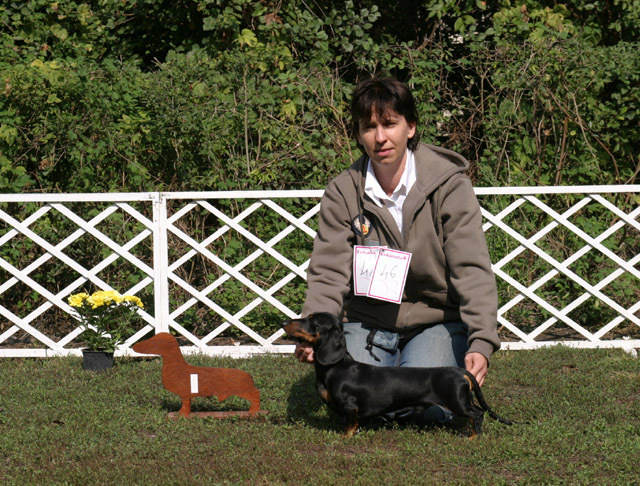 Even with its assertive character, the dachshund is engaging and can win the heart of most of the owners with its charming disobedience although, unfortunately, this may diminish the chances for a consistent training. The major part of our successes lies not in our own dogs, but in their puppies, who have ended up in promising places. Precisely because of this, would be owners are screened carefully. If the potential owner only inquires about is whether or not there is a puppy for sale and if yes, at what price, I see a problem. People with such an attitude will not understand when I try to explain the circumstances that must be provided for the healthy development of the puppy and which lay the foundation for the future career of the puppies intended for dog shows. Such people do not realize that the actual price of the puppy is nothing compared to the amount of money they will spend on quality dog food, entry fees for exhibitions, etc. in the next 10-15 years. We are very happy and proud that inquiries for our puppies come in from all over the world. Some of these inquiries come from breeders, but often, they come from would-be owners who know "exactly" the type of dog they would like. Some of the puppies born at Hubertus Primus are now living in Germany, Austria, Sweden, Norway, Switzerland, Hungary, Italy and Slovakia. They are not only all happy family "members", but in some cases also successful breeding- and show dogs. Breeding and participating in dog shows is a hobby for us, thus we are active participants of shows held both in and outside of Hungary. Our days are almost completely filled with taking care of our dogs, and we pay special attention to the older ones, as well. There is a great deal of work when a litter is born, and raising the puppies is not an easy task. We do our very best to find suitable owners for the puppies who will stay with them throughout their life. Our breeding strategy is a long-term one and we take advantage of all possible opportunities to promote this breed. While it is, of course, nice to achieve good results at dog shows, for me the personality of the dog, naturally with his/her appearance has become increasingly important. I know that it is not possible to raise all puppies to be winners, but we never breed just for "hobby's" sake. Our work and achievements over the past 10 years fill me with pride, but at the same time it also places a degree of responsibility on us. We are constantly working on further developing the quality of our breeding, while continuing to ensure and maintain the quality of the dogs who find homes. As a result, we sell puppies only if the circumstances are appropriate. 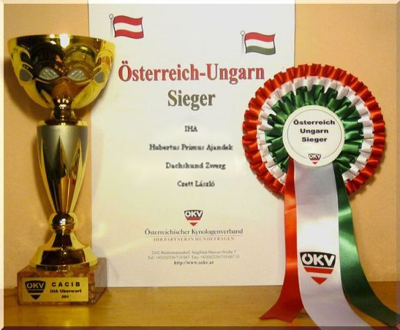 Since 2007, the Hungarian Association of Dachshund Breeders awards the "Dachshund of the Year", "Young Dachshund of the year" title at the end of the year when all the show results are in. Almost every year our dogs are recipients of at least one of these prestigious awards. First off, I always suggest that potential owners think over their possibilities and the extent to which this breed is suitable to their life and habits. Secondly, I always recommend that they check out other breeders, as well, and make a decision on which puppy to buy only after they have seen the behavior of the dog, the mother and the father of the puppy and the conditions in which the dogs are kept. My third suggestion is that no one try to buy a dog right away. A good dog is not a technical article that you decide to buy and then just simply take off the shelf in a department store. 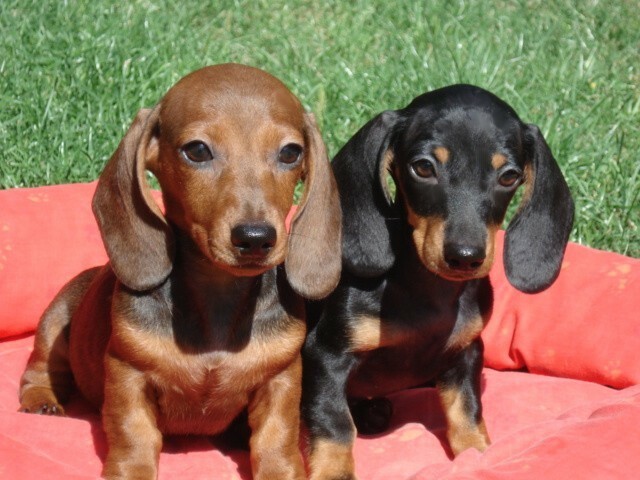 Honest and decent breeders do not have puppies available non-stop as if on a factory line. A litter must be planned. To date we are excited at each and every birth. We are together with the puppies continuously during the first two months of their lives and cannot imagine spending less time with them. It is this attention and care that ensures that the puppies who leave us are appropriately and suitably socialized. Last, but not least, a few words about the price. Everything has its price. The would-be owner only has to decide whether he/she wishes to pay it to the breeder or the vet. We are proud without exception of all our dogs, however, it is a special recognition if outstanding breeders buy from us or sell us a dog. I think this is the highest professional appreciation possible. In my opinion, breeding requires patience and the setting and reaching of new goals. I try to keep track of all the events regarding this breed both at home and abroad, and continue to foster already existing friendships. 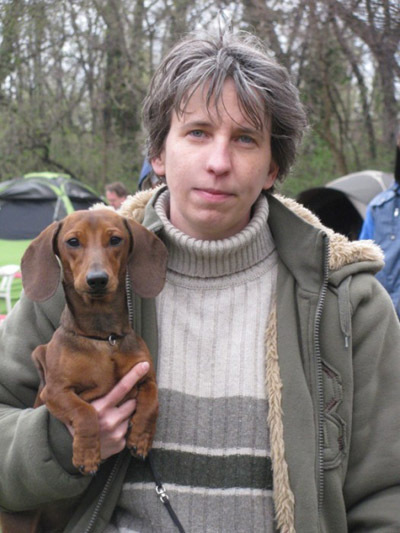 I consider it important to learn everything possible on both a theoretical and a practical level about my chosen breed, to constantly develop and categorize my knowledge about the dog's anatomy and breeding biology, be it a 2 day seminar or a complex cynology course, like the one held more recently by Attila Czeglédi in 2012. We must battle for success and recognition each and every time. In spite of this, we are never happier than when an owner calls us to say how grateful he/she is because they bought their dog from us. In fact, owners have been known to buy their next dog from us, as well. perhaps "you should try it". They are different from the other dogs, but in order for them to be the type of dogs we expect them to be, we, too, must relate to them differently! Copyright - All Rights reserved © 2016.